LOS ANGELES - April 14, 2015 - PRLog -- Eclectic instrumental surf rock is an easy way to describe Blue Wave Theory’s music. But when you listen to their sophomore album, Superstorm, and let their energy-filled tunes reel you in, you’ll hear the incredible range of genres influencing their songs. From reggae to rockabilly and fusion to psychedelia, Blue Wave Theory manages to represent the full spectrum of rock and roll. As you’re listening, you’ll also hear the emotional inspiration that they draw from worldly and personal experience. The versatility and musicianship of Blue Wave Theory makes ArtisTech Media thrilled to release Superstorm as a TuneTrack-LP today. Blue Wave Theory is an entirely instrumental band with Steve Rabeler as lead songwriter and on guitar, Bob Trimble as songwriter and on guitar, Kevin Stamper on bass, and Rob Wolleben on drums. They formed in 2007 and are based in New Jersey. You can find them rocking the stages of music venues and festivals on the East Coast including the Sellersville Theater, World Cafe Live, The Record Collector, Otto’s Shrunken Head, Musikfest, and the Asbury Park Surf Music Festival. Blue Wave Theory's music has also been licensed for a wide variety of purposes including Rolling Stone artist marketing videos, Samsung product advertisements, and DIY Network television broadcasts. Superstorm was named after 2012's massive Hurricane Sandy that hit the East Coast. Blue Wave Theory’s songwriting was influenced by the hurricane and a wide variety of other sources including Holstein cows, black and white TV, the theremin, Hawaiian volcanoes, a restaurant in Puerto Rico, woodchuck hunting, Rhode Island getaways, driving the highways of Upstate New York, playing Frisbee at the Jersey Shore, The Endless Summer, and Saab automobiles. Their new release merges these inspirations into the creation of a powerful aural landscape rooted in instrumental surf music. 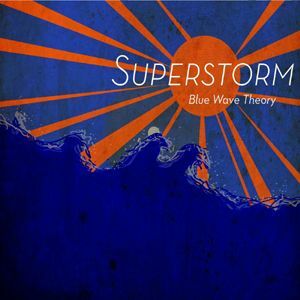 To support Blue Wave Theory’s music, join their Green Room at http://tunetrack.net/bluewavetheory/join/ -- members receive immediate CD-quality download of Superstorm with high-resolution cover art.